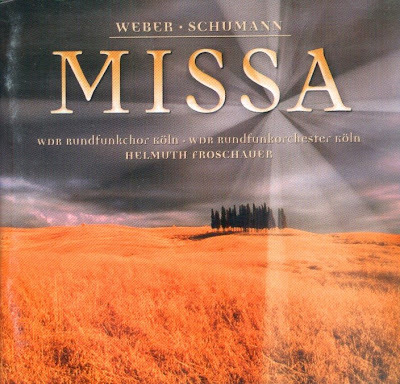 Gems Of Choral Music: Carl Maria von Weber - Missa Sancta no. 2 in G Major (Jubilation Mass 1819) (1786-1826) with Offertory "In Die Solemnitatis"
Carl Maria von Weber - Missa Sancta no. 2 in G Major (Jubilation Mass 1819) (1786-1826) with Offertory "In Die Solemnitatis"
The autograph of Weber's E flat major Mass, dedicated to the Archbishop of Salzburg and discovered only in 1925, provides early evidence of the fact that Weber was a born dramatist. He produced this astonishing proof of his talent when he was fifteen, and many years would pass before he followed it up with the two settings of the Ordinarium Missae he wrote in Dresden. Given to appending the words Soli Dei Gloria to most of his major scores in accordance with an old tradition, Carl Maria von Weber saw in the writing of his Jubelmesse for the King of Saxony (Missa Sancta no. 2, opus 76) in Dresden in 1818 more than just the fulfilment of an official duty. "When you hear my Mass, think fondly of me, for it came from the very depths of my heart and is the best I can give." One passage in a letter to his Berlin friend Hinrich Lichtenstein it to be taken altogether literally. Weber wrote that he composed his Masses overcome by the "most profound sense of the immensity of the thing". The golden wedding of the royal couple was celebrated in Dresden on MArch 17, 1819, a festive event that explains the name Jubelmesse (Jubilation Mass). Weber himself was hardly in a jubilant mood whilst writing it however. Indeed, the unfair treatment he was receiving at the hands of his superior and competitor Francesco Morlacchi, Kapellmeister at the Italian Opera in Dresden, adversely affected his already bad state of health. It should be mentioned that the Dresden Hofkirche produced what was tantamount to an absolute "caterwaul", as Weber put it, whenever the often fast-modulating sacred music of Luigi Cherubini and Beethoven was performed there. In a sense, therefore, the architect Gaetano Chiaveri indirectly exerted influence on the style of Weber's two Masses, for the composer was at pains to tailor them to the church's acoustics by keeping them comparatively simple and songful. The CD was released by Capriccio, 2002, (DDD). Capriccio 67001.